and pelargoniums, overwintering in the basement. The blooms enchanting me most are new granddaughters who'll be one month old this weekend, and their big sister who just turned two. No garden blooms could possibly be sweeter. Happy Bloom Day! 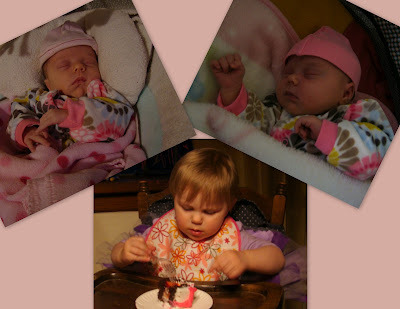 For more Garden Bloggers' Bloom Day posts, please visit Carol at May Dreams Gardens. 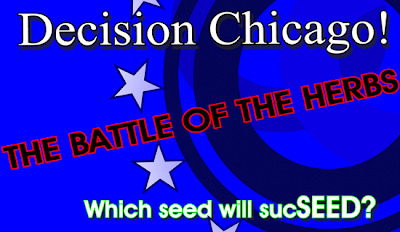 On Sunday, Feb 5th 2012 The Mike Nowak Show will host the first One Seed Chicago debate. Each of the candidates this year (cilantro, basil, chamomile) will have a representative on the air to make the case for the herb they hope to be the One Seed Chicago in 2012. The Mike Nowak Show airs on Sundays, from 9 to 11am central time, WCPT 820AM and 92.5FM, 92.7FM, and 99.9FM. The debate will be streamed on the Internet, for those who prefer to listen that way or who live outside the broadcast area. You can also participate via social media. On Twitter we'll be using the #HerbDebate hashtag to cheer on our candidates and their representatives. I'll be on the show tomorrow, making the case for chamomile. Hope you can join us for what should be a fun segment of seed politics soil slinging. You can learn more about chamomile, basil, and cilantro. Chicago metro-area residents can vote for their favorite seed here. A packet of the winner's seeds will be mailed out to every eligible participant in the Chicago area.